Suzy Klein with the best in classical music, plus this week's guest, sculptor and Royal Academician David Nash. Your ideas for companion pieces on the Essential Classics playlist. This morning, it's Josef Haydn's so-called "Hen" Symphony, a nod to the quirky first movement that early listeners likened to the ungainly gait of a farmyard chicken! 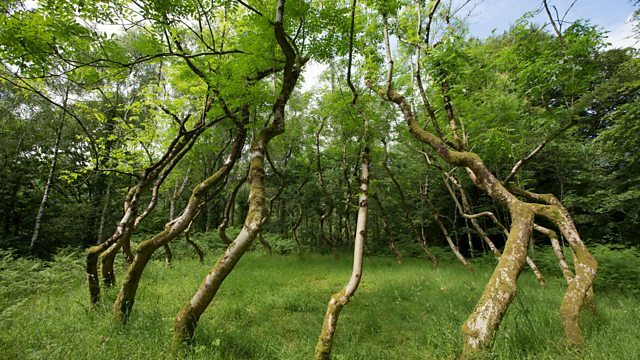 As Radio 3 goes Into the Forest, Ian Skelly meets sculptor and Royal Academician David Nash, to learn about his work with wood. Liszt: Solo Piano Works: Jorge Bolet. Performer: Fabio Biondi. Performer: Giangiacomo Pinardi. Performer: Nathan Milstein. Orchestra: New York Philharmonic. Conductor: Bruno Walter. Performer: Catherine Mackintosh. Performer: Robert Woolley. Ensemble: Purcell Quartet. Singer: Richard Wistreich. Orchestrator: Academy for Ancient Music Berlin. Singer: Andreas Scholl. Handel: Ombra mai fu: Andreas Scholl, Akademie fur Alte Musik Berlin. Performer: Avi Avital. Performer: Mahan Esfahani. Performer: Ophira Zakai. Performer: Patrick Sepec. Performer: Sarah Willis. Orchestra: Kurpfalzisches Kammerorchester. Conductor: Johannes Moesus. Performer: Philip Ledger. Music Arranger: Benjamin Britten. Singer: Robert Tear. Performer: Benjamin Britten. Performer: Mstislav Leopoldovich Rostropovich. Conductor: Klaus Tennstedt. Orchestra: Berlin Philharmonic Orchestra. Wagner: Orchestral music from 'The Ring': Berlin Philharmonic/Tennstedt. Performer: Simon Hewitt Jones. Performer: David Worswick. Performer: Tom Hankey. Performer: Oliver Coates. Performer: Thomas Hewitt Jones. Performer: Daniel Swain.